Emergency Locator Transmitter (ELT) with our Summer Perfect Combo and Visa Gift Card rebates. Only available in the United States of America. 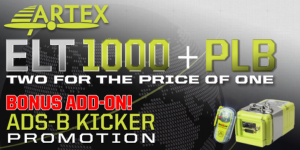 SPECIAL BONUS ADD-ON – ADS-B KICKER PROMOTION! Recieve a $50 dollar Visa gift card with the purchase of an Perfect Combo or ELT 1000 kits with antennas, excludes portable ADS-B Solutions. Get your Free Installation with a purchase of any Avidyne IFD!